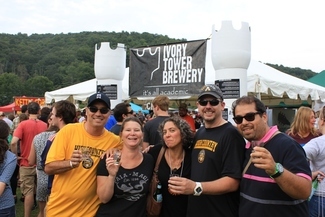 The dozen members of the High Country Beer Fest and Ivory Tower Inc. thank you for your interest in helping put on one of the top beerfests in the region and this year will be our 12th event!! We have been planning this year's event and, we can't pull it off without our volunteers! Volunteers must be 21 years old and in exchange for a few hours of work will be able to sample beers from the 52 breweries, get a festival volunteer T-shirt, and contribute to a great High Country event that benefits local non-profits and the fabulous ASU Fermentation Sciences Program! Please locate a position and time that you can cover during the event. If you find that you are unable to attend the event please remove yourself from the list immediately so that others have time to fill that position and prevent the Beer Board from being short handed the day of the BeerFest. As always you can contact us about any questions you may have. Note this work is for the day before beerfest. You will open up chairs and tables and place where board members instruct you to do so. Make yourself available for various different tasks during the festival. Help fill in the gaps to get things done more efficiently. Keep patrons divided into the two rows for ID/banding/ticket processing, or buying tickets and volunteer/sponsorship lines. You are the first folks who interact with patrons arriving at the event so keep a smile on your face and be cheerful! Make sure that all patrons in seats are provided with each of the beer pairings. Do not let people into the tent if the seats are completely filled but make sure to usher people to open seats until they are filled. Clean up after each pairing. Man the games area and make sure corn hole and other games stay put - prevent controversies among players and organize short game tournaments for folks looking to take a break from tasting beers. Basically, you're the gamemasters! Make sure that all patrons in seats are provided with each of the beer pairings. Do not let people into the tent if the seats are full but make sure to usher folks into any open seats until they are filled up. Clean up after each pairing. Get one of the 12 special Exit Strategy Tshirts from the volunteer checkin table. Hand out the “Got Ride?” cards with all the alternatives to driving home. Make sure you are aware of all the options. Free buses, DDs, & free towing.